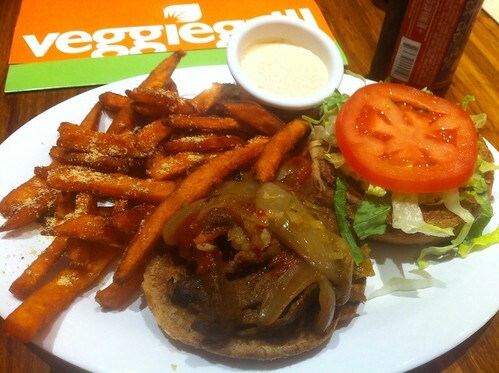 PPK | Hot vegan chick.....peas! Man, I love this place. 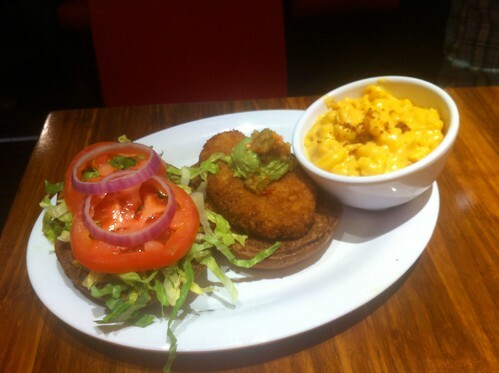 Some of the sandwiches are just ok, but what they do right they do really well! 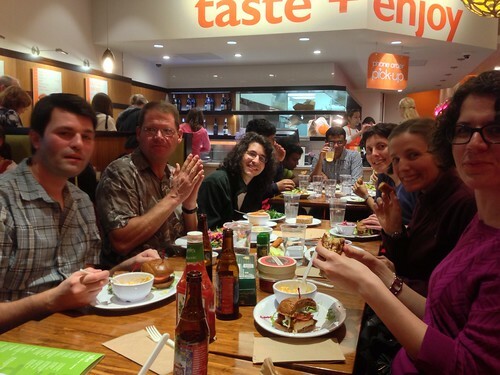 Here are some of my PPK buds (including Amey and Carrie) at our recent meetup. I love these peeps! We also got chocolate mousse and carrot cake for dessert. I think the cake tasted a little like baking soda but the mousse was fantastic!! Does anyone remember having cream of celery chicken & rice in their pregan days? It and similar meals were among my favorites as a kid and my mom had lots of these types of recipes in her weeknight dinner arsenal — simple, cheap, and easy comfort food at its finest. I’ve always wanted to veganize this, but I wasn’t sure what to sub in for the chicken and for whatever reason it didn’t occur to me that I could buy/make vegan condensed “cream of” soups. Well, duh, it’s totally possible and delicious, as we discovered this week! If you want to keep with the Campbell tradition and go all store-bought, you can find dairy-free cream of celery soup (I spotted it at Whole Foods) and packaged seitan, but it’s going to cost a chunk of change and honestly, I just don’t think a lot of packaged vegan foods (esp veggie meats) taste very good. If you’re looking to impress, go with homemade! You can make the soup and chicken in advance and freeze them, to have a quick meal at your fingertips. *What to sub for chicken? 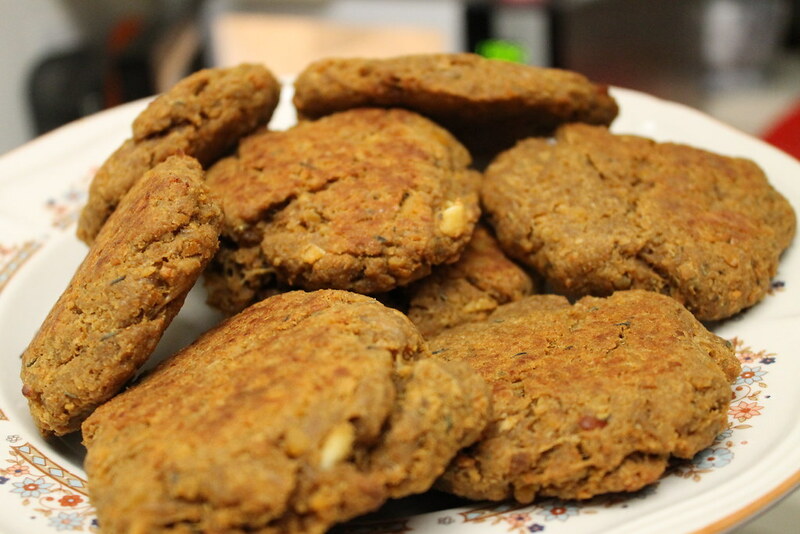 Chickpea cutlets from Veganonicon. F’reals, these things are life-changing. 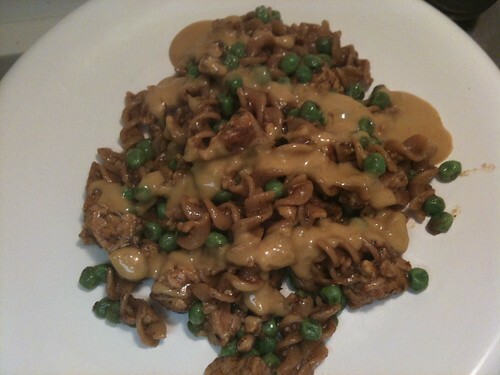 Savory and chewy, I will never buy seitan from the store again (plus they’re cheaper and healthier!). I follow the recipe exactly, except I don’t knead each cutlet individually or stretch it out into cutlet shape; I just grab a chunk of the dough, roll it into a ball and slightly flatten it with my hand, brush lightly with olive oil, and bake. I think they come out softer this way, but it’s a personal preference. Layer the bottom of a Dutch oven with the cutlets. Spread the soup over the cutlets. Cover, and simmer on the stove for 20 min. Alternatively, put cutlets and soup in a baking dish and bake at 350 deg F for 20 min. When done, soup should be slightly brown and thickened. The cutlets will be softer and will have absorbed some of the soup. 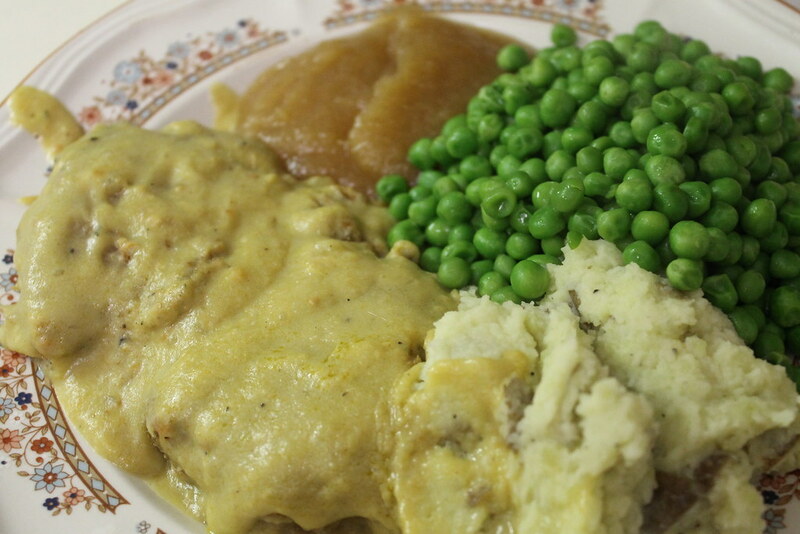 Serve over mashed potatoes with green peas and applesauce on the side. Cream of celery soup (adapted from this recipe from Allrecipes.com). Bring stock to boil in a large pot. Add the celery, carrot, and onion and simmer about 30 min, or until veggies are really soft. Sprinkle in flour, salt, pepper, soy milk powder, and margarine and stir to combine. 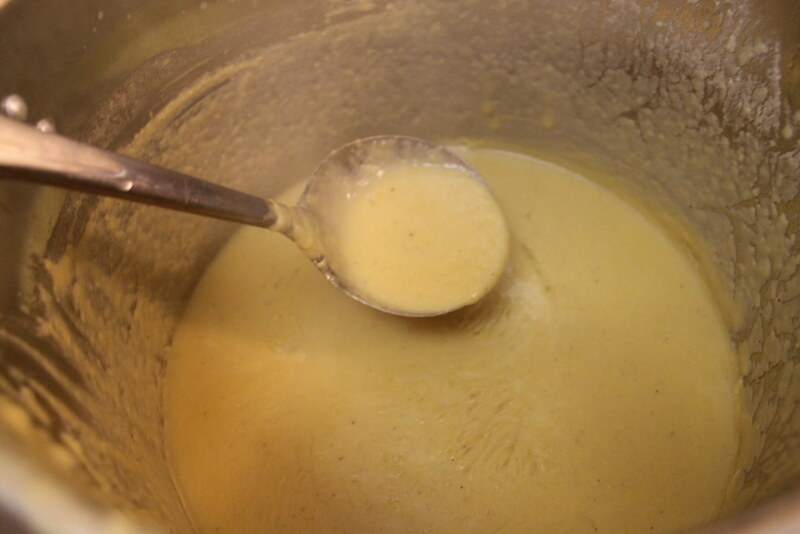 Puree mix in blender until smooth and creamy, then return to pot. Add corn starch/water mix, bring soup back to a boil, then simmer until thickened, stirring constantly. Over at the Post Punk Kitchen forum we are embarking on twelve weeks of vegan cooking, drawing from some of the most popular vegan cookbooks. This is a great way for me to get out of my cooking funk and try out new recipes from books I’ve owned for ages. I’m sure I’m like a lot of people, in that I buy a book, try out a few recipes, and then file it away. What a waste!! I’d love to eventually work through every cookbook I own (and sooner rather than later, so I can think of some great recipes to serve at our wedding reception in July). This week’s challenge is to make recipes from books by Isa Moskowitz and Terry Romero. I’ve recently discovered how amazing the salads are from Veganomicon and we just happen to be experiencing a nasty heat wave so it looks like this week I’ll be making salad! 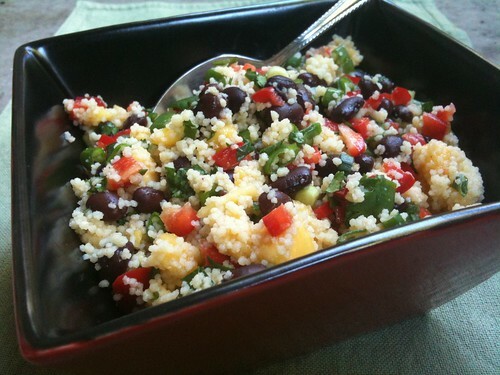 I’m starting off with “Quinoa Salad with black beans and mango”. It’s a pretty easy recipe and calls for quinoa, black beans, mango, red bell pepper, cilantro, and scallions tossed in a little red wine vinegar and olive oil. I subbed cous cous since I was out of quinoa and it was super tasty!